This weekend I made egg whites for breakfast. And where there are leftover egg yolks, there are Spaetzle (Homemade German Noodles) to be made! Spaetzle are very simple to make, but definitely require some muscle, as the dough gets very thick. In the grand scheme of when my parents make spaetzle, this is a small batch recipe. This fed our family of 4 for 2 dinners. Spaetzle heat up very well for a second time in boiling water. Put a pot on the stove and get your water boiling. Salt the water. Put flour and salt in a bowl and make a well in the center. Add the egg yolks and egg whites. Begin stirring flour into eggs a little at a time. 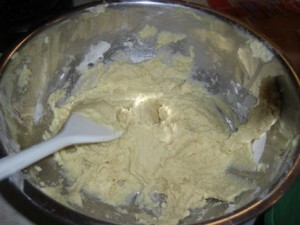 As soon as the dough gets thick and unmanageable, add some water. This is where it gets tricky because I can’t tell you exactly how much water to add. You just need to eyeball it. You don’t want the dough to be thin. You want it to be thick, like wall paper paste. The dough will be sticky. I added water 3 times to this batch - adding maybe 3-4 tablespoons at a time. Once the dough is ready, place it in the spaetzle (noodle) machine and push! 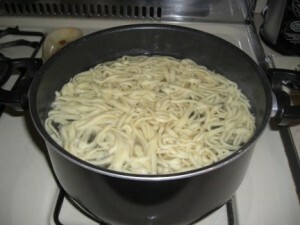 Boil the noodles. You want them to float on the top of the water and then you still want them to cook another 2-3 minutes. 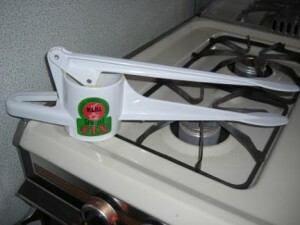 Remove with slotted spoon and drain. Enjoy! The Destroyer loves anything messy and sticky spaetzle dough is no exception! 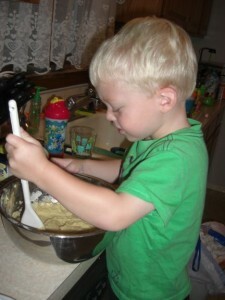 Though since the dough is so thick and unmanageable for a 2 year old, he came and went rather quickly. The dough will be thick and sticky. If you think it looks like wallpaper paste - you’re all set! Here are my spaetzle cooking. I haven’t made them in a while and I was a little nervous. My dad even called me while I was making them to “make sure I was doing ok”. WTF? It is water, flour and eggs. How much could go wrong? Oh….Um…yeah. I forgot. We are talking about me. Anyway - CheezWaster christened them as tasting just like Opa’s. A sure sign that I did good! And my dad even ate them the next day saying they were good (but that they needed more salt - in my opinion, they didn’t, but he is the pro). Making Spaetzle (Homemade German Noodles) has been posted in Crafty Mamamamahoney and Tagged: German noodles, homemade german noodles, homemade noodles, homemade pasta, making German noodles, making homemade noodles, making spaetzle, making spatzle, noodle recipe, noodles from scratch, pasta recipe, spaetzle, spatzle.